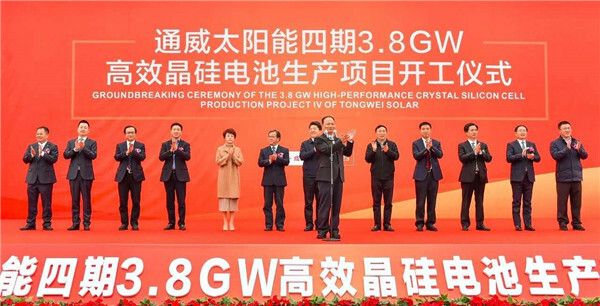 On March 23rd, Tongwei Solar Chengdu 4th phase 3.8GW high-performance silicon solar cell project launching ceremony was solemnly held in Tongwei Solar Chengdu base. Mr. Cao Junjie, Deputy mayor of Chengdu Municipal People's Government, Mr. Hanyi, Vice Chairman of Chengdu committee of CPPCC, Mr. Chen Lin，Director of Standing Committee of Shuangliu District People’s Congress, Mr. Li Delong, Chairman of Shuangliu Committee of CPPCC, Mr. Liu Hanyuan, Standing Committee Member of the 11th CPPCC, Deputy to the NPC, Board Chairman of Tongwei Group, Mrs. Zhuo Yujiao, President of Tongwei Group, Mr. Xie Yi, President of Tongwei Solar, Mr. Yan Hu, Vice Chairman of Tongwei Co., Ltd., Mr. Guo Yizhong, President of Tongwei Co., Ltd., Mr. Hu Rongzhu and Mr. Huang Qigang, Vice Presidents of Tongwei Group, attended the ceremony. Along with the kicking off of the 4th phase of the project, Tongwei Solar Chengdu Base will become the first 10GW solar cell plant in the world.